Signalling and Control includes the systems set up to ensure safe operation of multiple trains, track switching, scheduling, and related systems. Some estimates also include “communications”, with expenses such as wi-fi basestations that allow on-board internet connectivity. If we ignore the control centres and tunnel hardware and convert everything else to a per-km cost, and assuming a station frequency of 100km for the HSR system, it adds up to $490,000/route-km. But the total cost estimated in AECOM13 is $1.6 billion, or $915,000/route-km – almost twice as much! Perhaps we need to include the tunnel based wi-fi repeaters. AECOM13 specified 144km of tunnel (8% of the total distance), so that would add a cost of 0.08*$1m/km, or $80,000/km. Still not enough. Even if we guess that the $2000/km for transponders was a typo that actually meant to read $200,000/km, it still only adds up to $770,000/km (this is unlikely – balises are very simple devices). Yet again, AECOM13 does not seem to support its own cost assumptions. 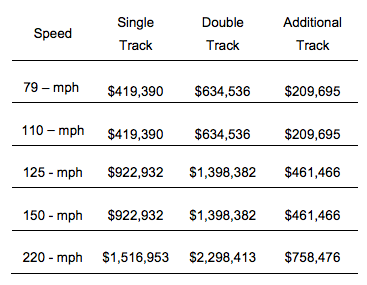 Still, let’s take $915,000/dual-km as a datapoint for a 400km/h design speed, 0r $613,000/track-km assuming single track is two thirds the cost of dual. What other estimates can we find? 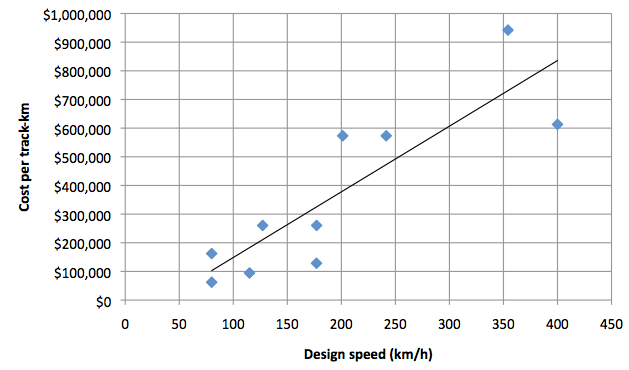 The University of Iowa study by von Brown (2011) gives estimates for signal costs versus design speed. To convert the following table to $/km, divide by 1.61. Von Brown’s estimates are actually substantially higher than AECOM13. The Australian Rail Track Corporation estimated the replacement cost of the Australian network in 2007. The average cost of signalling and control was $43,259/track-km for signalling, and $9,711/track-km for communications (this converts to $50,921 and $11,431 in 2013 dollars). The highest cost was $75,137/track-km for signalling and $16,493/track km for communications in the Casino-Acacia Ridge project ($88,446 and $19,414 in 2013). This was for relatively low-speed track; assume a general top speed of 115km/h, or 80km/h for freight only. It would be better to cost signalling and communication on an individual basis. For this we will go back to AECOM13 data, but multiply the cost per turnout or crossover by 0.67 to account for the lower design speed. Also, people can go without wi-fi when they are breifly within tunnels. Seriously. PS – the awesome manga of a high-speed train cockpit comes from Anomonny at DeviantArt. Love it. cost, economics, featured, literature, manga, signalling. Bookmark.